Objective To describe the characteristics of bruising and mode of presentation of children referred to the paediatric child protection team with suspected physical abuse (PA), and the extent to which these differ between the children where abuse was confirmed and those where it was excluded. Setting and patients 519 children, <6 years, referred to two paediatric child protection teams. Main outcome measures The mode of presentation, number, anatomical distribution, size and appearance of bruises according to whether PA was confirmed or excluded. ORs with 95% CI were calculated where relevant. Results PA was confirmed in 69% of children; the rate varied from 84% when abuse was witnessed, admitted, alleged or where explanation for injury was absent or implausible, to 50% where there was a concerning history. Significantly more children with PA had bruises (89.4%) than PA-excluded (69.9%) and had significantly more sites affected (p<0.001). The odds of a PA child having bruising to: buttocks/genitalia (OR 10.9 (CI 2.6 to 46), left ear (OR 7.10 (CI 2.2 to 23.4), cheeks (Left (OR 5.20 (CI 2.5 to 10.7), Right OR 2.83 (CI 1.5 to 5.4)), neck (OR 3.77 (CI 1.3 to 10.9), trunk (back (OR 2.85 (CI 1.6 to 5.0) front (OR 4.74 (CI 2.2 to 10.2), front of thighs (OR2.48 (CI 1.4 to 4.5) or upper arms (OR 1.90 (CI 1.1 to 3.2) were significantly greater than in children with PA-excluded. Petechiae, linear or bruises with distinct pattern, bruises in clusters, additional injuries or a child known to social services for previous child abuse concerns were significantly more likely in PA. Conclusions Features in the presenting history, the extent and pattern of bruising differed between children with confirmed PA and those where abuse was excluded. These findings can provide a deeper understanding of bruising sustained from PA.
Young children who are referred to the paediatric child protection team with suspected physical abuse (PA) frequently have bruises. It is unclear whether there is any difference between the pattern of bruises when PA is confirmed and when PA is excluded. Bruising is the commonest injury seen in physical abuse. 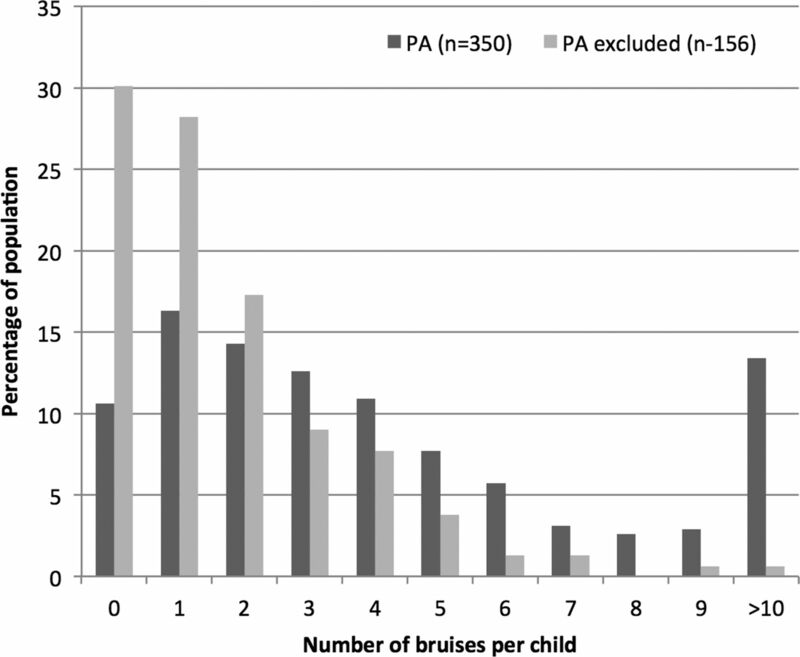 In a population of children with suspected physical abuse (PA), the prevalence, number, and characteristics of bruises vary significantly between children with PA and those where PA is excluded. The odds of a bruise on the buttocks or genitalia, cheeks, neck, trunk, head, front of thighs, upper arms were significantly greater in children with PA than in children with PA-excluded. Petechiae, linear or bruises with distinct pattern, bruises in clusters, additional injuries or a child known to social services for previous child abuse concerns were significantly more likely in PA.
A preschool child presenting with suspected physical abuse (PA) presents challenges to the paediatrician who must undertake a clinical and forensic assessment of injuries to determine the plausibility of any explanations offered and whether these fit with the injuries seen. Following a full history, examination, appropriate clinical investigations and a multiagency assessment, a consensus decision is made by the multidisciplinary child protection team as to the likelihood of PA.
Bruising is the most common injury sustained by children who have been physically abused. Paediatricians must have the skills to differentiate abusive bruises from those that arise from everyday activity or unintentional injury. A systematic review in 2005, updated in 2012,1 ,2 identified a paucity of literature characterising abusive bruising in children. There were only three published comparative studies that investigated differences in the distribution, number, pattern and appearance of bruises between children who were abused and those who had unintentional injuries,3–5 and none set out to describe the pattern of bruises in children referred to the child protection team with suspected PA. This study describes the characteristics of the presenting history, the prevalence, number, distribution and characteristics of bruising in preschool children who had been referred to paediatricians for the assessment of suspected PA and the extent to which these differ between the children where abuse was confirmed and those where it was excluded. A retrospective cross-sectional study of the case records of consecutive children, aged less than 6 years, who were referred to two paediatric child protection teams in southeast Wales for clinical and ‘forensic’ assessment of suspected PA, between November 2003 and December 2011. Cases were identified from child protection clinical records at the University Hospital and neighbouring Hospital Board: children with bleeding disorders were excluded. The same method of recording data had been used over the entire period. Six categories were defined according to the reason for referral (figure 1). Children were deemed to have suffered from PA if that was the outcome decision made at multiagency child protection strategy meetings or case conferences6 where a joint decision as to the probability of PA based upon all information available. A second group of children, ‘PA-excluded’, were cases where PA was excluded at a multiagency meeting or by the clinical team. A third group of children were suffering from either a medical or ‘other’ cause. Reasons for referral for paediatric assessment of suspected physical abuse. A standardised clinical proforma was completed contemporaneously for all children, recording all visible injuries on a body chart and any injuries identified from radiological investigation. The location of each bruise was recorded according to one of 36 anatomical sites, together with the size and appearance: petechiae, bruise of a distinct shape or within a cluster. Bruises on the shins, often deemed to be a universal finding among ambulatory children, were not consistently recorded by clinicians during a child protection assessment, and thus were excluded from the analysis. The child's age, gender and most advanced motor developmental milestones were recorded. There were three categories of development: (1) baby: premobile, rolling or sitting; (2) early mobility: crawling, cruising and (3) walking independently. Data were anonymised and entered on to an access database by the research nurse. Data entry was checked for duplication and accuracy by an independent data entry clerk. For binary data, proportions were compared using χ2 tests; adjustments for confounders and estimation of ORs were achieved using logistic regression. Means were compared using t tests when the distributions were approximately normal. Count data were modelled using negative binomial distributions, and generalised linear models using this distribution were used to compare means when adjusting for other factors. Hypothesis tests were conducted using a 5% level of significance. Ethical approval was granted for this study by Southampton & South West Research Ethics Committee No. 05/MRE11/8. National Information Governance Board approval was given to use child protection case notes for a case record review and analysis of anonymised data. Five hundred and eighteen children were identified from records. Twelve cases, with medical cause (7), neglect (1) or Mongolian blue spot (4) were excluded from further analysis. The reasons for referral and child protection outcome are shown in figure 1. Data were collected from 506 children; 100 children were referred to the child protection teams from the emergency department, 25 from hospital inpatients and the remaining 381 were referred from social care. PA was confirmed in 350 (69.2%) and excluded in 156. In 84% of PA-excluded, the decision was made at a case conference or strategy meeting; the remaining decisions were made by the clinician prior to discharge. The proportion in which PA was confirmed varied according to the referral category (figure 1). PA was confirmed in at least 84% where abuse was witnessed, admitted, alleged or where the child had an unexplained injury, but in only 50.5% where the reason for referral was a concerning history. Of the 200 children with a concerning history (group iv, figure 1), 186 had a single explanation for the injury. In 92 of these children, the explanation was considered implausible, and PA was confirmed but was excluded in the remaining 94 children. Multiple explanations were provided for 14 children, in nine of whom PA was confirmed. Sixty per cent of the total group were male and the mean age was 20.8 months (table 1). There were no significant differences in age (p=0.67) or gender (p=0.81) between the children with PA and those with PA-excluded. The developmental status of the children differed across the two groups with significantly more babies but fewer early mobile children in the PA group than in the PA-excluded (p<0.001). Children in the PA group were significantly more likely to have bruising than children PA-excluded: 89.4% (313/350) vs 69.9% (109/156), difference 19.6% (95% CI 12.0% to 27.7%). Fitting negative binomial regression models showed that PA children had significantly more bruises and more sites affected than the PA-excluded group (p<0.001 for bruises and sites) (figure 2, table 2). Number of bruises per child and percentage of children with physical abuse and physical abuse excluded who were affected. There was a significant difference between the mean number of bruises and number of sites affected between walking and the earlier developmental stages (all p values <0.01), but the difference between baby and early mobility was not significant (p=0.26 for the number of bruises and p=0.55 for sites affected) (table 2). The locations of bruises were recorded in 36 categories. As laterality was not a significant factor for certain sites (eg, front of thigh), and other sites were very rarely bruised (eg, wrist), the 36 locations were reduced to 17 (table 3). Table 3 shows the percentage of children, in both PA and PA-excluded categories, with at least one bruise in each of these 17 locations; the results were subdivided by developmental stage to show how bruising varies by location and developmental stage. The odds of a PA child having a bruise on the buttocks or genitalia, cheeks, neck, trunk, head, front of thighs, or upper arms, were significantly greater than in PA-excluded children (table 3, figure 3). These results make the assumption that the effect of abuse status is the same, regardless of development stage. There was no significant interaction between abuse status and development stage, and so the assumption appears reasonable. Regions of the body (shaded area) where bruises were significantly more likely to occur in a child with confirmed physical abuse than in one where physical abuse was excluded. Petechiae were reported in 54 (15.4%) of the 350 physically abused children, and in three (1.9%) of the 156 PA-excluded children. The difference is highly significant OR 9.3 (95% CI 2.9 to 30.2). Linear bruises or bruises with distinct pattern (slap mark, finger tip bruising or matching an implement or object) were seen in 51 children (47 physically abused, 4 PA-excluded) OR for PA 5.9 (CI 2.1 to 16.7). A cluster of bruises was defined as the presence of at least two bruises in the same location, using the more detailed set of 36 locations. Of the 313 abused children with at least one bruise, 211 (67.4%) had at least one cluster, compared with 37 (33.9%) of the 109 abuse-excluded children. Clustering of bruises was significantly more likely in PA children, OR 4.0 (95% CI 2.5 to 6.4). The most common sites for clusters included the upper arms, the cheeks and the front and back of the trunk. The mean size of bruises in the two groups was very similar, 1.53 cm in the PA group and 1.57 in the PA-excluded group. Forty-seven (13%) of the 350 children in the PA group were known to social services for previous child abuse concerns, in comparison to 8/156 (5%) PA-excluded (OR 2.9 (95% CI 1.3 to 6.2). Eighty-eight (25.2%) of the PA children had additional injuries compared to 10% (16/156) of PA-excluded group (OR 2.9 (95% CI 1.7 to 5.2). Of the PA group, 30/350 (8.6%) had abusive head trauma, 50 (14.3%) had fractures (only 26% (13/50) had bruises overlying the fracture, eight of the 30 acute fractures had overlying bruising). Twenty (5.7%) children had additional soft tissue injuries: bites (7), abrasions (3), burns (4), torn labial frenum (6), and subconjunctival haemorrhage (1). Significantly fewer children with abusive head trauma had bruises than the remaining children with confirmed PA (60% (18/30) vs 93.4% (299/320) OR 0.1 (CI 0.04 to 0.25). PA was confirmed in 69.2% of children under the age of 6 years who were referred for assessment of suspected PA. There were significant differences in this percentage between different referral scenarios (figure 1). Eighty-three per cent of the overall population had one or more bruises, with a significantly higher percentage in those in whom PA was confirmed compared with those in whom it was excluded. These children had significantly more bruises distributed over a greater number of regions of the body than when PA was excluded. There was no statistically significant difference in the age or gender of the child or the size of the bruises between the PA confirmed and PA-excluded group. Bruising to the left ear, cheeks, neck, trunk, front of thighs, upper arms, buttocks and genitalia were found significantly more frequently in the PA-confirmed children, than when PA was excluded. These regions are not typically bruised in falls and unintentional injuries2 in this age group. There was also a preponderance of left sided cheek and ear bruises. As far as we are aware, there have been no other studies comparing bruising patterns in children where PA was confirmed with those where PA was suspected but excluded after assessment. Other studies have compared abused children with different groups of children with unintentional injuries. An earlier study by this group3 compared an older population of abused children, aged from 1 to 13 years, with those in a general paediatric outpatient setting. Bruises on the head, neck and trunk were more common in abused children compared with controls. Nayak et al4 showed that bruising to the head, neck or trunk was more common in children referred for suspected PA than in children seen in the emergency department for unintentional injuries. Pierce et al,5 in a case-control study of children less than 4 years old who were admitted to paediatric intensive care (42 children with PA and 53 with trauma), found that bruising to ears, neck, right arm, hands, chest, buttocks and genitalia was more common in PA children than in those with unintentional injuries. The populations of index children and comparison groups included in these three studies are all very different from those in this study, an important point. when comparing study findings. Nevertheless there is broad consistency across studies between the sites of bruising that are more common in PA. It has previously been estimated that 21% of children (under 3 years of age) have bruises at any one time from unintentional injury and everyday activities.12 The prevalence varied with motor development from an estimated 0.6% in those under 6 months of age to 52% in children who are walking.12 Thus, not every bruise on a child who has been physically abused is necessarily abusive in aetiology. Previous studies have shown that unintentional bruises occur over the front of the body12 ,13 and on bony prominences: the facial T is a typical location for facial injuries after slips, trips and falls.14 In our study, bruises over the forehead, nose, mouth and chin were common in abused children as well as in those where abuse was excluded; some of these may represent bruises sustained from unintentional injury in the abused children. The pattern of bruises in children with unintentional injury and the variation over time will be the subject of a further study by this group. There is an inherent risk of circular reasoning in any study that analyses the signs of PA in the absence of an independent gold standard diagnostic test. The nature of the bruises themselves may form part of the decision as to the likelihood of PA. The decision made by the multiagency child protection team was taken as the confirmation of abuse, where all factors were considered on an individual child basis by piecing together all explanatory, clinical and social factors and, thus, minimising the influence of the characteristics of the bruises themselves. This study confirms that while every child presents with a unique combination of features and circumstances, when analysed on a population basis, distinct patterns of bruising emerge that differ between children with confirmed PA and those with PA-excluded. These findings have the potential to provide a deeper understanding of bruising which can only improve the quality of the clinical decisions when recognising and evaluating young children with suspected PA.
We would like to thank the Medical Research Council for funding this study and associated programme of research; Anne Russell, Anwen Howells, Children's Young Persons Research Network, NISCHR Wales for data collection; Dr Alicia Rawlinson for coordinating data from one of the two centres, Ciara Harris, Physiotherapy Student, Birmingham University for data entry checking and Professor David Fone for advice regarding original grant application.
. Mother-child play interaction in neglecting and non-neglecting mothers. Early Child Dev Care 1993;87:59–68.
. Are there patterns of bruising in childhood which are diagnostic or suggestive of abuse? Arch Dis Child 2005;90:182–6.
. A scoring system for bruise patterns: a tool for identifying abuse. Arch Dis Child 2002;86:330–3.
. How useful is the presence of petechiae in distinguishing non-accidental from accidental injury? Child Abuse Negl 2006;30:549–55.
. Bruising characteristics discriminating physical child abuse from accidental trauma. Pediatrics 2010;125:67–74.
. Forensic dermatological aspects of the battered child syndrome. Aktuelle Derm 1979;5:217–32.
. Patterned abusive bruises of the buttocks and the pinnae. Pediatrics 1992;90:633–6.
. Who slapped that child? Child Maltreat 2008;13: 298–300.
. The cutaneous manifestations of child abuse and neglect. Am J Dis Children 1979;133:906–9.
. Skin manifestations of the battered-child syndrome. J Pediatr 1968;72:99–101.
. Bruises in infants and toddlers; those who don't cruise rarely bruise. Puget sound pediatric research network. Arch Pediatr Adolesc Med 1999;153:399–403.
. The prevalence and distribution of bruising in babies. Arch Dis Child 1999;80:363–6.
. Craniofacial injuries from slip, trip, and fall accidents of children. J Trauma 2007;63:70–4.
. Can the initial history predict whether a child with a head injury has been abused? Pediatrics 2003;111:602–7. Contributors AMK: Principal investigator, study design, study coordination. Lead writer of the manuscript, descriptive data analysis. SM: collaborator, involved in study design and supervision, paper writing and editing of final drafts. FD: Statistician, collaborator, statistical analysis, paper writing method and results section, editing final drafts. PC: Clinical collaborator, study design and steering group, paper writing and editing. DN: Research nurse, data collection, data extraction, database entry, supervised double data entry, ethics submission, research governance and liaison with ethics committee, R and D, NIGB etc. Funding Medical Research Council, grant number G 0601638. Ethics approval Southampton & South West Research Ethics Committee No. 05/MRE11/8. Data sharing statement Data from the study would be available if authors are contacted subject to agreements within the ethical and NIGB approvals for the study.